Mosquito B Mk IV of 1 PRU RAF 1942. Mosquito B Mk IV of 105 Squadron RAF 1942. 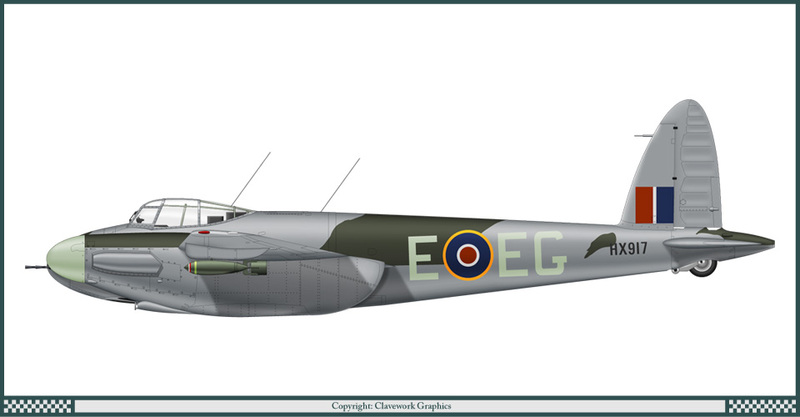 Mosquito B Mk IV of 109 Squadron RAF 1943. Mosquito B Mk IV of 139 Squadron RAF 1943. Mosquito B Mk IV of 627 Squadron RAF 1944. Mosquito B Mk IV of 692 Squadron RAF 1944. Mosquito B Mk IV of BOAC 1943. Mosquito FB Mk VI of 1 Bomb Squadron RAAF 1945. Mosquito FB Mk VI of 464 Squadron RAAF 1944. Mosquito FB Mk VI of 418 Squadron RCAF 1944. 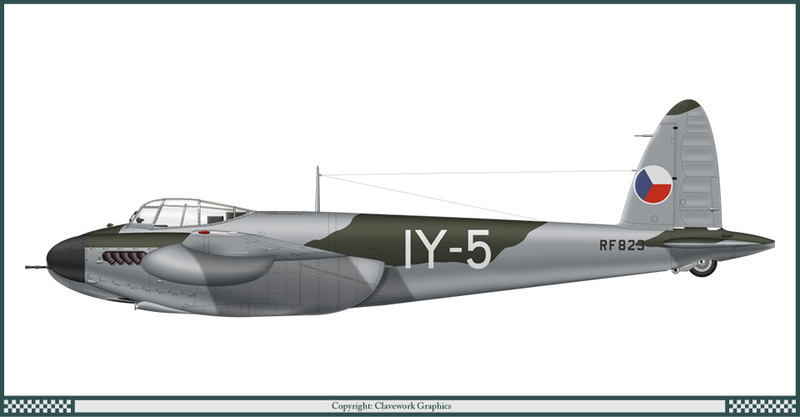 Mosquito FB Mk VI of the Czech Air Force 1947. Mosquito FB Mk VI of the Dominican Republic Air Force 1948. Mosquito FB Mk VI of GCI/6 French Air Force 1951. 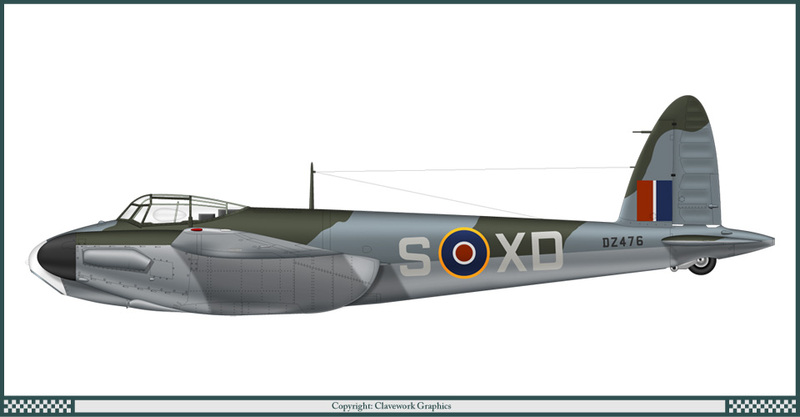 Mosquito FB Mk VI of 21 Squadron RAF 1945. Mosquito FB Mk VI of 45 Squadron RAF 1945. 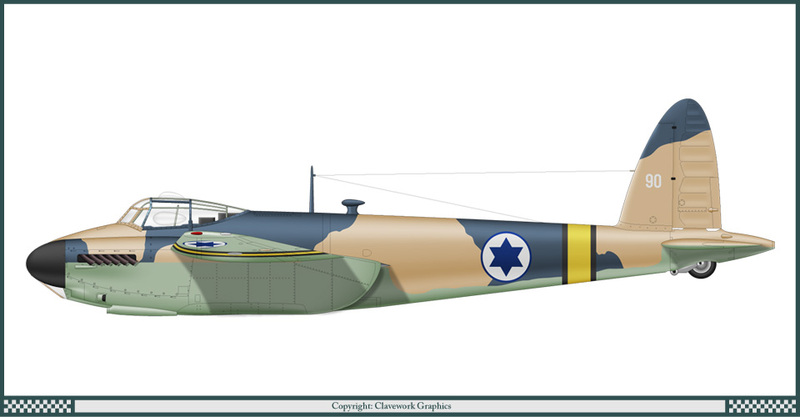 Mosquito FB Mk VI of 119 Squadron IDF 1951. Mosquito FB Mk VI of 487 Squadron RNZAF 1943. Mosquito NF Mk II of 23 Squadron RAF 1942. Mosquito NF Mk II of 157 Squadron RAF 1942. Mosquito NF Mk XIX (J30) of the Swedish Air Force 1950. Mosquito PR Mk XVI of 544 Squadron RAF 1944. Mosquito PR Mk XVI of the IDF 1956. Mosquito PR Mk XVI of 60 Squadron SAAF 1946. Mosquito PR Mk XVI of the 653rd Bomb Squadron USAAF 1945. Extremely beautifully done, Clave my friend. Thank you !! Having stood next to a Mosquito under restoration, and having read Chas Bowyer's rather lengthy book on the Mosquito, I'm suitably impressed by your renderings here. I'm very glad you retained the distinctions between the canopies, as many modern artists do not. The same errors regarding canopies were made by illustrators in certain books during my teen years, which errors detracted heavily from the value of said books. Warm Kind and Respectful Regards Clave my friend, Uyraell. A beautiful and excellent representation of a fine aircraft Clave! I just joined up as research on RAF 627 Squadron brought me to this website and your posted Mosquito pictures. I was not able to open any of them but would sure appreciate being able to see the 627 Sqn Mark 4. A family friend did 3 tours as a navigator in bomber command, came home to Canada in late 43 to become an instructor and got "invited" back to become a Pathfinder navigator. He was KIA in November 44 returning from marking a raid on Trondheim, Norway - crashed in the Shetland Islands, low on fuel on a dark and stormy night. My email is available in my profile. F/L John Reid RAF(pilot) and F/L Doug Irwing RCAF (navigator) died Nov 22 1944 23:00 hrs in DZ642. A memorial monument and the remains of the aircraft are on Royl Hill, north of the Sumberg Airport on the south end of the Shetland Islands.